Phillip King’s abstract sculpture `Red Between’ has been installed in its new home in the revamped Quadrangle, behind the VG&M. ‘Red Between’ was located outside the Sydney Jones Library but was moved as part of its refurbishment. 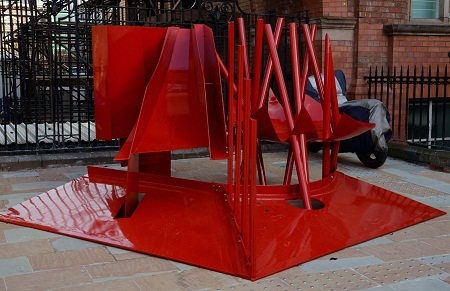 Made from painted steel in 1971-3, `Red Between’ has recently undergone some conservation work and takes up its new residency in the archway between the Johnston and George Holt buildings. Phillip King is a British sculptor who worked as an assistant to Henry Moore, taught with Anthony Caro at Central St Martin’s and represented Britain at the Venice Biennale in 1968.